This is a photo of the remnants of a streetside shrine erected one year and one day ago, in the city of New Orleans. One of over 100,000 people trapped in the flooded City of New Orleans, a woman named Vera died on the corner of Jackson Avenue and Magazine Street in the narrow un-flooded strip of the city. I don't know why or how Vera died. Maybe she had a heart attack, succumbed to heatstroke or didn't have her insulin. What I do know is that other people nearby, trapped in the same desperate situation, found a shower curtain, some paint, and some bricks. They covered her body where it lay, and made a makeshift grave. 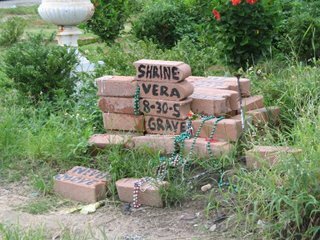 Somebody knew her first name, so they painted it on a brick and on the plastic sheet marked, "Here Lies Vera," which covered her body. No doubt you saw the original photo in Time magazine or some other news publication. While some people elsewhere in the city engaged in mayhem, some others found it within themselves to perform this most basic act of human dignity with the few resources they had at hand. I don't know who these people were. I do know that, one year later, people still leave offerings to the unknown Vera. This woman was one of the tens of thousands who had made their way to the dry part of town after losing everything. She was also one of the thousands who died: on the streets, trapped in attics, in dark and desperate hospitals, and in the rising floodwaters. Vera's shrine has become a folk icon for all of Katrina's victims. Hibuscus bushes have been planted near where she lay. Flower-filled urns and vases have appeared on the grass nearby. People still leave Mardi Gras beads, candles, flowers, and other mementos often seen at roadside death memorials. Vera's body has been removed, but the makeshift headstone remains untouched, and I do think the entire neighborhood would mutiny if anyone ever tried to remove this sad but incredibly sincere little pile of bricks. Vera died about one block away from Garden District Needlework. Something about this fact disturbs me quite deeply. She likely died for want of basic medical response, in the middle of the street, in a neighborhood that only a day or so before was throbbing with people buying coffee at four dollars a cup, "retro" disco dresses at fifty dollars each, and colorful yarn at ten bucks a skein. Yet there was no piece of merchandise inside those boarded-up shops and restaurants which could have saved Vera's life. A woman died on a tiny spot of sidewalk, across from a little shopping-block in a major city in the United States of America, as the city crashed from the top of the First World to the bottom of the Third World in the space of forty-eight hours. I will not attempt to be funny today. One year ago, Hurricane Katrina made landfall, killing over 2,000 people and countless animals ... flooding 150 square miles in New Orleans alone ... destroying close to 20,000 square miles of coastal Louisiana, Mississippi, Alabama and Florida ... scraping entire towns off the face of the Earth in coastal Mississippi ... and leaving half a million people homeless. I will not write about knitting today, either. Instead, I will sit for a good long while, and knit something simple, and meditate on the profound events of that day, the critical days afterward, and the past year. I will also light a candle, and think about Vera, and the other lives lost which she represents. Wherever you are, please take a few moments out of your day to do the same. Midnight update: Today, in the Katrina anniversary news, I learned that "Vera" was Elvira Smith, age 66, who was known as "Vera," and who died after being run over by a hit and run driver in the mayhem following the flooding. Rest In Peace, Elvira Smith. You deserve it. And there is a candle being lit here today in Canada in memory of Vera and all the unnamed victims. Thank you for keeping it real and personal. Today is my birthday. I will celebrate some, but will spend a good portion of the day remembering, and praying that this will never happen again. I will also watch Spike Lee's film on HBO this evening. Thank you and God bless. Rosemary C in San Jose, Ca. may God continue to be with you and your work thru the years. and with all the people of New Orleans and the Gulf Coast. i posted on my blog about today as well. a sad day for all of us. We can't forget, but many of our neighbors have. Thanks for all you do.